To be christened with the name “peaceful” among a group of birds already well-known for their calm demeanors is quite an accomplishment. Yet the beautiful little Zebra or peaceful dove (Geopelia striata) lives up to its reputation admirably. Confiding in humans, the zebra dove gets along very with finches, canaries and button quail, and makes a fine parent if left undisturbed while nesting. The zebra dove ranks just behind the closely related diamond dove and the ring dove in popularity, and captive bred birds are readily available. Ranging from Thailand south through Malaysia and Indonesia to Australia, escaped and released zebra doves are also established in Hawaii, Madagascar, California and other places. At 9 inches long, the zebra is one of the smallest available doves. This, and its quiet but attractive colors (gray with a red blush about the neck with black and white striped sides) render it ideal for those with limited space. Although adaptable to a large parrot cage (where floor space is more important than height), this delightful little bird shows itself to best advantage in an outdoor aviary, at least during the warmer months. If approached slowly, zebra doves adjust well to people…habituated birds kept indoors should be allowed free flight time if at all possible. Zebra dove care closely follows that of the diamond dove (please see article below). 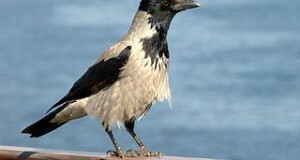 They are, however, less cold-tolerant than their smaller relative, and more likely to abandon their nest if disturbed. Therefore, the zebra dove cage or aviary should always be located in a quiet location. In a well-planted aviary or spacious cage, however, they often become quite trusting of people and may breed regularly. Zebra doves can be cared for in much the same manner as diamond doves. Please see my article, Diamond Dove Care, for further information. To learn more about the keeping the popular ring dove, please see Aviary Birds: the Ring or Collared Dove. I feed the birds and squirrels,and raccoons(4) today a mourning dove must of flown into my glass slidind door. when i got home there he or she laid at my door. the 2 mourning doves always travel together,but I never did see the mate until 7 pm sitting on the bird bath just looking all around for the mate ,I fellt so sad. what can I do? any suggestions.also do you know wher I can buy less expensive bird or squirrel food. i’m spending around $30.00 a day for food. i need some help . Hello Diane, Frank Indiviglio here. Thanks for your interest in our blog and my compliments on your concern for so many creatures. Did the dove fly into a glass door? The most effective way to prevent this is to hang a curtain or something similar behind the door, so that there appears to be a solid barrier. Small decals are also available, but these yield mixed results. Sometimes, however, a bird that has been frightened by a predator will crash into a window even in familiar territory – there is nothing that can be done to prevent this. As both parents assist in raising dove chicks, there is a good chance that any currently in the nest will survive. As for cutting food expenses, you can back off a bit on quantity during the warmer months. I enjoy feeding animals year-round as well (please see my article Feeding Wild Birds in Spring and Summer), but decrease the volume offered at times. All species readily adjust to this, so you will not be causing any hardships. Our squirrel log contains the equivalent of 12-24 ears of corn, and, due to its consistency, takes squirrels a bit of time to consume. Perhaps this might be of use to you. 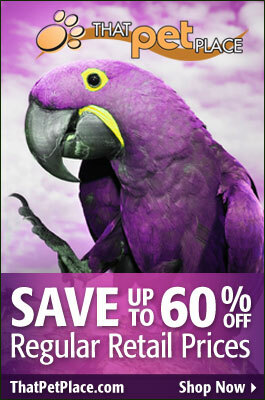 Also please check out our daily specials for sales on bird and wildlife food. You may also wish to sign up for email announcements of sales and special offers. We have had two sets of zebra doves laying eggs and nesting in our big window box/cage. The cage bars/slats are big enough for pidgeons to fly in and out of, and today a huge crow landed. One of the zebra dove chicks was missing, and we hope the bigger brother had managed to fly away. We attacked the crow and with big difficulty it managed to escape. We are waiting for the mother and father of remaining chick to return, but worry that it was attacked before we could witness the crows arrival. The crows are still circling and looks like they are not finished with wanting to attack the remaining zebra dove. If the zebra’s parent dont return, should we try to feed the remaining weak chick? Thank you for any suggestions from here in Bangkok Thailand. Hello Chang, Frank Indiviglio here. Thanks for your interest in our blog and sorry for the bad news…crows here in the USA rob nests as well. Unfortunately, pigeon and dove chick feed upon a unique liquid food, called “crop milk” that is produced from the lining of the parent’s crop (the food storage organ at the base of the throat); parents do not bring them insects and such as do other birds. To raise a baby dove, you would need to use a crop milk replacement formula. If you can locate a local pigeon interest group or pigeon breeding organization, someone there could likely direct you to a source. Specialty stores supplying pigeon breeders (show pigeons, fancy pigeons, pigeons for use as food, etc) are the usually the only source for the formula. There is also a formula that can be made at home, using chicken baby food (human babies, that is), eggs, yogurt and various vitamins. You can find the formula and feeding directions here…even if all the ingredients are not available, the basics might be enough to keep the bird alive, especially if it has been feeding from the parents for awhile. I’m interested to learn what happens…please keep me posted. Thank you Frank for your prompt answer. About an hour after the incidednt, I noticed the father zebra dove was watching the nest from afar. Three crows were still circling the area, flying past our window box and crowing. Soon when the crows were not visible (to me) the dove returned to the nest and coddled the chick. I’m hoping the mother will also return. It is still difficult for me to guess what happened as I only caught the crow after the fact (?). I suppose there is hope that the parents will continue nourishing the baby, definitely the weak one of the brood. Is there any way to make sure the crow doesnt return? It was quite a battle, my wife hitting it with a stick as it struggled to get out through the narrow slats of the cage. Then a piece of vine caught its foot when it exited and it was hanging and flapping on the outside until we disengaged the vine from the cage. We definitely scared the big and scary bird – even I found it very intimidating. Thanks for your advice, I now have some knowledge I never knew I might need. I hope I dont need it in this case. Thanks for the most interesting update! Doves are very resourceful – the male may be able to sneak back and raise the chick alone..I think that would be the best option, as hand-rearing is difficult. Well I guess your wife is a formidable adversary! Crows of all species are very intelligent and good at figuring out ways to get what they want. Please see this article for notes on their tool-using abilities, quite amazing. Unfortunately, physically attacking it is probably the only effective method you can use near a home; hopefully the crows will realize they are no match for your wife (I suppose you must be careful as well!). As spring arrives here in the US, people often find doves that have fallen from their nests…your story has inspired me to write a new article on hand-rearing, thanks. Are zebra doves common in Bangkok…perhaps escaped pets? Good luck and please let me know how it turns out. Hi Frank, yes my wife is indeed a formidable adversary when the occasion rises. Thanks for the kind words and update. I’m sorry to hear the news, but the doves, you and your wife put up quite a battle. Doves sometimes re-furbish and then re-use an old nest, but your pair may not as they may consider it a dangerous site. Yes, interesting but sometimes sad how quickly things progress in the tropics. I’ve worked in Latin America and, after having lived in temperate areas for so long, was amazed at the pace…and the great diversity of species. I looked into zebra dove ranges a bit and found that those within Bangkok are mainly wild, native birds that have adjusted to city life (as mourning doves do here in the US); escaped pets add to their numbers. I’ve always been interested in Thailand’s rich tradition of bird-keeping; many more species are kept there than here in the US. Older Thai friends of mine here in NYC often take their birds outside for “walks” in the fresh air. Here we cannot keep the North American (Red) Cardinal, but some of the South American specie are sometimes bred (please see this article)…is this so in Thailand? Very interesting to have your input – I almost made it to Thailand to do some work with turtles, am still hoping to; until then I would enjoy your comments when you have a chance. Hi! I’m new to “That Bird Blog”. This article on zebra doves is why I decided to register to this website! I understand this is an old article but I thought I’d post my comment anyway. I live on the island of Oahu, in Hawaii, and zebra doves are all over the place, just like the article says. During this past June, my fiancé and I were spring cleaning and repainting the outside of our home when he knocked over a bird’s nest from off the rain gutter, not realizing there were 2 newborn chicks in it! The parents never returned to them and we ended up taking them inside, fearing they would starve to death. I frantically researched and called people, trying to quickly learn how to care for them. I knew nothing about birds! I wish I had come across this website sooner. To make a long story just a bit shorter, I now have a 3 month old zebra dove living in my home. He’s my little companion, he loves people, and he seems to be happy and healthy here. I have been trying my hardest to give them the best life he can have in captivity and I’m constantly trying to learn new things on how to improve his quality of life, as he is the first bird I’ve interacted with. I fear he would not survive in the wild if I were to put him outdoors, so my question is this: what kind of advice can you give me as to what to do in this situation? I would like to keep him as my permanent pet but I really have no idea where to start. I’m afraid that if we have to move to another state, I wont be able to bring him along with us! If anyone could provide me with any information on this, I would greatly appreciate it. Hello Yvonne, Frank Indiviglio here. Thanks for the kind words; I receive an email notice of all comments posted on my articles, so no need to worry about date. Congrats…it’s not easy to raise a young dove. You’re probably right in worrying about releasing it; sometimes they take up with wild doves but as yours is imprinted on people it may not do well. Individual state laws will determine if it can be imported…they are not native to the USA, so not protected by US F&W Service, but may be regulated by the state law. I can find out for you when and if the time comes. You can care for the dove as described in this 2 Part article on Diamond Doves. I noticed when I visited Maui’s Botanical Garden there were several Zebra Doves in a cage there. I wonder if they were birds like yours that were hand raised? There may be places like that on Oahu as well, but maybe you could leave your pet there if you have to move? Just thought I would let you know. I love their call and when I hear it then I think of Hawaii and smile 🙂 Have a great day! 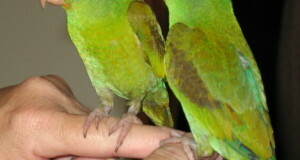 Thanks for the info; rescue groups and bird clubs are sometimes able to point people towards placement optios as well. The good news is that despite the horrible crow attack last year, the zebra doves have returned to the exact same spot where there are remnants of the old nest, and have brooded over two sets of chicks since then. This time my wife pushed the heavy plant pots closer together, making it quite hard for anything larger than a zebra dove to access the nest. We do still watch weariliy as the crows caw loudly as they fly past. Another worrisome time is when the chicks stand on the edge of the window box and get ready for their first flight. We are delighted to have these regular visitors who trust us and share their family creation with us, are free to be so close and remain wild and autonomous at the same time. Thanks for the update; great news and very interesting to hear that they used the same sit; I thought they would abandon it. Very nice that your wife has outsmarted the crows! I was hoping you might be able to shed some insight as to what this new little movement, and sound he does might mean. Thanks so much! Do zebra doves have multiple chicks at a time? I guess a more specific question is do they raise multiple chicks simultaneously? There is a nest at my workplace and I used to see 2 live baby doves and now one is dead, it’s head is hanging out of the nest upside down and it hasn’t move all day, and the other is alive. The parent keeps coming and going but i almost feel like it either neglected the dead baby or it died of disease. The parent just sits on the dead chick as if it wasn’t there so it can get close to the live one. Crap. Both are dead. This morning one was dead and one was alive. I just climbed up a ladder to check out the live one from afar, around 17 feet away, and found both dead. This was minutes after one parent came and sat with them for a bit so I assumed one was alive. This is the second time I’ve found both chicks dead at approximately the same age even with the parents coming and going frequently. Any idea what’s going on? It’s not unusual for one or more chicks (any species) to die…usually the parents will toss it from the nest, I’m guessing that this one is lodged in somehow. They feed the largest and strongest first, to assure that at least one survives. Weaker, smaller chicks often do not receive enough food, and parents do not try to portion it out…some species actually toss weak chicks, and in others (some eagles, i.e.) stroger chicks may kill weaker siblings. There could be problems as the body decomposes, as the odor will attract predators and flies, hornets, disease, etc. thanks, i think ill go for getting additional birds to encourage breeding, iv seen spotted doves being sold too, theyre usually in a sorry state and i wont have second thoughts in getting them so i can relocate them in a better environment. finally, i bought 2 pairs of spotted doves and another pair of turtle doves from different vendors, i felt obliged to get all of them since most of these birds eventually die if not sold. i was thinking of releasing the first pair of spotted doves in our area, but considering weak laws on widlife trade in our country, they would probably end up with trappers again, im thinking they probably have better chance of surviving with me. So, to add more to my expenses, i had to buy a large cage for them, i have a seperate cage for each specie now, i hope ill have success in breeding them though. Will canary seed suffice? i mean not only in survivability but healthy eggs, fertility etc. Best to give them more variety…add parakeet seed and some of the other foods (greens, etc) as mentioned in this article….or look into commercial mixes specifically formulated for small doves.